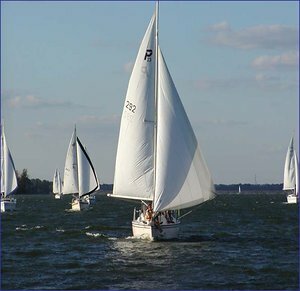 Learn the basics of this great sport aboard 22 to 27 ft. Sailboats on Alum Creek Reservoir . Don't worry, these sailboats will not capsize! Find out how easy it can be to get started in a very exciting, fun, and challenging sport designed for the beginner sailor. Let our knowledgeable volunteer Instructors teach you the basics of sailing aboard their own sailboats. Don't let your age or gender stop you from a rewarding passage into the community of sailing. As a student of our basic sailing class you will be invited to participate in various ACSA social activities. Courses are offered three times during the season, either on Sunday afternoons or Thursday evenings. The classes are hands-on, mostly on the water, with one Introduction to Sailing/Orientation shore class. The course fee includes instruction, books and all materials, use of a life jacket as well as a graduation party. For more information, please contact our Learn to Sail Coordinator. They will be more than glad to help you.